Tommy Ramone, the last surviving founding member of seminal US punk band The Ramones, has died aged 65 in New York, the group has announced. Born in Hungary, Ramone immigrated to the US in the 1950s. He started The Ramones with three friends from a New York high-school in 1974. The band have been credited with the invention of punk rock. Although they were never commercially successful, their unique sound helped shape rock music and is still often cited as inspirations to new generations of musicians. "There are hundreds, there are thousands, there are millions of melodies happening in Ramones songs," the biographer, Everett True, told the BBC. "You hear their influence stretch across all of rock music from 1975 onwards... you just hear it everywhere," he said. 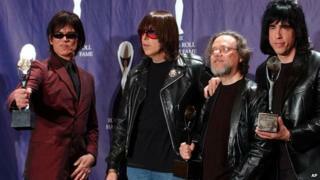 Their hit songs I Wanna Be Sedated and Blitzkrieg Bop, among others, earned them an induction into the Rock and Roll Hall of Fame in 2002. News of Ramone's death was announced on the band's official Facebook page. He was the group's drummer from 1974 to 1978, and co-produced their first three albums. By 2004, three of the founding musicians - lead singer Joey Ramone, guitarist Johnny Ramone and bassist Dee Dee Ramone - had passed away. In a 2007 interview with the BBC, Tommy Ramone said the band had been heavily influenced by the 1970s eccentric hard rock act New York Dolls, singer-songwriter Lou Reed and leading pop art figure Andy Warhol. "The scene that developed at CBGB wasn't [for] a teenage or garage band, there was an intellectual element and that's the way it was for The Ramones," he said. Media captionBBC Broadcaster and fan Liz Kershaw says The Ramones "changed music"